That's what $28 before taxes will get you around here. The retail price of the groceries is $101 according to my receipt. I look at the pile of things and think "no way would anyone in their right minds pay $100 for this much food!" I have trouble paying $28 because there's just not a lot. 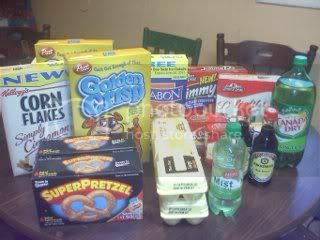 This was a junk food stock up week because of a weekend camping trip. I did get a great deal on Silk soy milk and cheap potatoes. But it wasn't a good "staples" week, that's for sure. Thank goodness I still have staples! 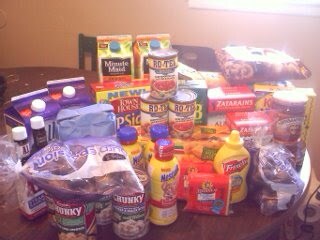 I was able to get some good staples at Winn Dixie today. I spent $16 before taxes and came away with some goodies :) The total pre-sale and pre-coupon was about $55. My car died and well...now I'm stuck at home with four kids and they are driving me NUTS! Trying to find a ride for the kids who missed the bus. Not fun at all. What made things worse? I came home from WinnDixie to discover that The Fabulista (who is still has moments when her secret identity The Terrorist comes out) used too much toilet paper and it was overflowing...everywhere. D was home but he was getting ready for the camping trip. He managed to stop things but the cleanup was my job. Good times. I had to reread your post like 3 times to believe you only paid $28 for ALL OF THAT!! I mean I wouldn't pay $101 but I would never expect to get it for $28. YOU GO!! That's awesome!